Back to Amazon: my last Amazon S3 bill was $48.60 and less than $20 bucks from that was storage and the remaining about $30 was mostly request fees, some transfers that I have no idea how are made since I only backup there (never actually needed to retrieve anything) and fees for files already deleted (but are still kept in some kind of “recycle bin”). My December bill was $53.60. Currently, I have around 1.1 TB of data that I back up at Amazon S3. Moving that to Spaces will cost me 1.11 x 1024 x $0.02 = $22.5. Plus I get first two months for free so that will save me another roughly $100 for the first two months. As a bonus I won’t have to think anymore about requests or storage classes or anything. The only thing I need to know is amount of data I need to store (and additionally amount of data that I need to retrieve from the storage over 1 TB). Now, I know that Spaces might not be the best solution for mission-critical backups (because it probably offers lower redundancy compared to S3) but I’m quite sure that it’s probably good enough for my needs. 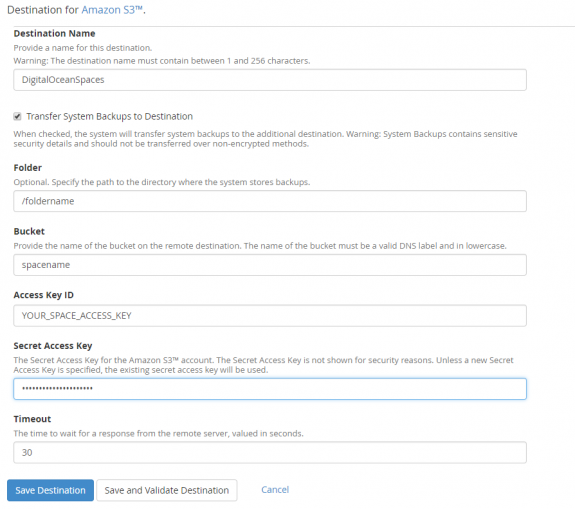 Since Spaces use same API as Amazon S3 it should be compatible with (almost) all tools that you can use to manage S3 meaning that it should be compatible with WHM backups. But no matter how I tried to set it up – it just wouldn’t work! Recently WHM have introduced native support for all S3 compliant object storage providers including DigitalOcean. This helps a lot since editing of WHM/cPanel core files is no longer needed and using DigitalOcean Spaces for backups is just couple clicks away. Folder: folder within the Space where all your backups will be. You can leave it if you want backups to be stored at root of your space and not in some folder. If you put folder that doesn’t exist on Space – it will be created automatically and all backups will be stored in that folder. If validation was a success that means that your server can now access DigitalOcean space and that it can copy server backups there. To finish the setup is you can switch back to Backup Settings tab and configure all other things related to your backups (what to backup, how and when). NOTE: The information below is obsolete since the introduction of S3 compatible backups in WHM and you should not use it. Please make sure that you have made a backups of files and accounts before making any changes !!! 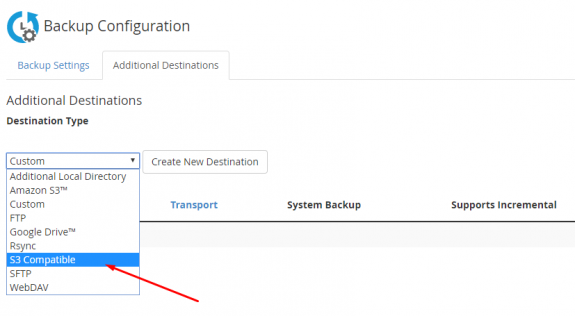 You can backup only to Spaces in ONE Region !!! You are doing this at your own risk. I can’t be held responsible for any damages or data loss this may cause !!! 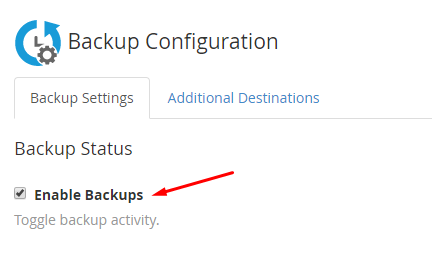 Before we start, if you already have a WHM backup running on Amazon S3 go to WHM > Backup Configuration then scroll down and disable the S3 backup clicking on action Disable next to the S3 backup. Make a backup of this file before making any changes ! Make sure that you have put the correct Spaces url, depending on the Region of your Space. Save the changes and go back to WHM. I know this is a hack but I sure hope that cPanel guys will soon make the necessary changes so any S3 compatible service can be used for backups – not just Amazon S3. This tutorial worked for me, thanks for your effort. This Article helped me too, now I have next step that how to restore backup from DigitalOcean Spaces. Waiting for your reply. I’m happy to help or work on this issue. We have an option of s3cmd. My only concern is that after an auto update yesterday, I got an email this morning that backup transport had failed, turns out that the update had cleared these changes. I’m going to try copy this script (with the fix) into a custom script, and will update tomorrow how that goes. Hmmm, update, I can’t get the custom script right, and it’s too late to continue tonight.